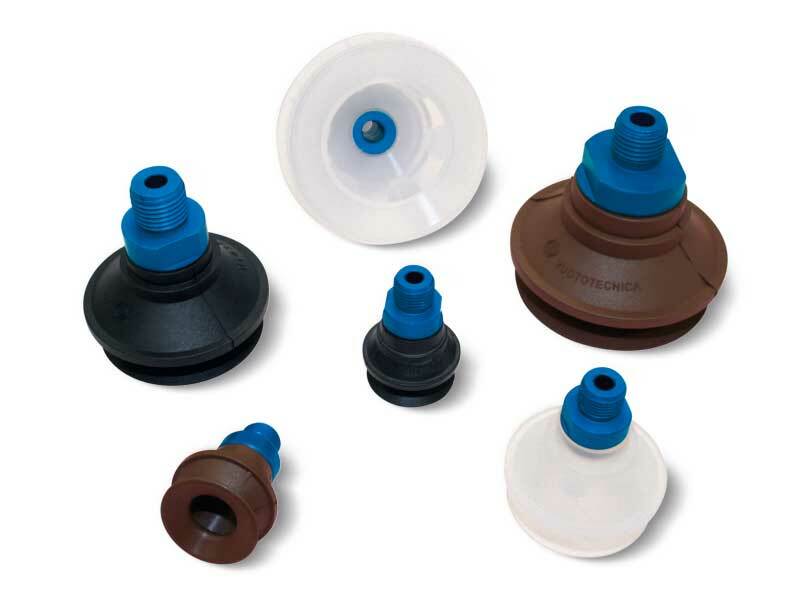 The particular shape of these BELLOW CUPS allows them to quickly crumple up when in contact with the surface of the load to be lifted and in presence of a vacuum. this quick movement prevents the load below from remaining stuck to the surfaces or load underneath. Thanks to this particular feature, these BELLOW CUPS are recommended for handling paper and cardboard sheets, thin metal sheets, wooden panels, glass sheets etc. Thanks to their great flexibility, they can also be used to compensate flatness errors or for gripping on inclined surfaces. Their anodised aluminium supports are provided with a threaded male or female central pin to allow suction and to fasten it to the machine. The cups can be assembled onto them with no adhesives. For the spare part, all you have to do is request the cup indicated in the table in the desired compound.